Interesting in bits, tenuous arguments in some places, outright outrageously silly in some, and with a huge 'Freakonomics' hangover. 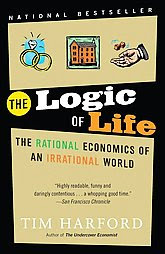 Many situations and outcomes in life can be explained by applying a line of rational thinking, in the author's opinion, but there are weakly argued passages, egregious overlooking of alternate explanations, overly narrow applicability of some situations, and some where the author blithely overlooks obvious justifications for the rational thinking that he propounds. In comparison to his previous book, The Undercover Economist , this book places a weak second. In comparison to Freakonomics too this book is a disappointing tribute. Both books well deserve a five-star rating. Two stars for this book may appear harsh, and three stars would not be out of order for the book, but I am doing some relative grading here. Looks written in a hurry, and with the desire to use the logic of rational thinking as an overarching basis for explaining too wide an array of situations and behaviors. 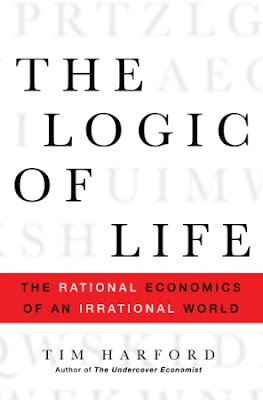 There are nine chapters in the book, each delving into a different aspect of human behavior, and where the author attempts to explain human behavior and responses to situations using a theory of rational behavior, even when there does not seem to be any obvious rationality at play, or where the individual actions, rational though them may be, lead to results that are less than optimal for society as a whole. 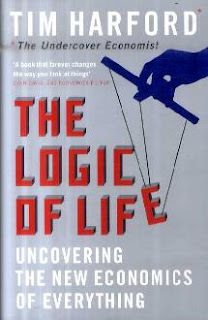 Introducing The Logic Of Life - or how the threat of AIDS affects peoples' sexual mores. Is Divorce Underrated? - economic freedom, stemming from educational emancipation, can set women free. Why Your Boss Is Overpaid - why, despite everything, your boss is still undeservedly underpaid (and this is a tautology). For my money the only two good chapters in the book are "Is Divorce Underrated", which cogently uses the age old theory of supply and demand to argue how education, birth control, and a little bit of emancipation have helped reduce the gender gap; and "In the Neighborhood", though this chapter on neighborhoods would not stand scrutiny in a developing country in India, nor would it be economically or environmentally feasible or responsible. The other chapters that barely pass muster, and this is in my very personal, opinionated, irrational, and partly educated opinion, are "Why Your Boss is Overpaid", "The Dangers of Rational Racism". The outright stinkers or very disappointing chapters have to be "A Million Years of Logic", which is a sorry apologia for imperialism, and "Las Vegas", which fails miserably to explain the fascinating obsession with gambling that people have. More to follow in a future post, with explanations, commentary, excerpts, and rants. Other cover images from different editions of the book. The first one seems similar in style to the author's first book, 'The Undercover Economist"
The second cover is positively strange. Why would you want to have a photo of a broken egg oozing all over your cover? 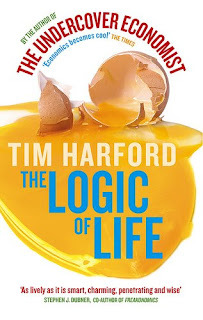 If the egg is meant to represent life, then surely a broken egg can only convey the end of life, at least for the egg, or for the the chicken that would have hatched from the egg, or the other way round, depending on whether you believe the egg came first or the chicken. Either way, once the egg is broken, there ain't no chicken comin' out of nowhere. That's the only logical conclusion one can draw. The third cover is quite nondescript and quite misleading too... Who is pulling the strings? And whose strings are being pulled? Is this a whodunit? No. A conspiracy theory? No.